The middle Rio Grande valley is an area of great cultural importance in New Mexico. It was occupied by Pueblo Indians since prehistoric times and by Spanish explorers and settlers for over 400 years. Spanish explorers first visited the Bernalillo area in 1540 when Francisco Vásquez de Coronado moved east from the Pueblo of Zuni to establish winter quarters for his famous expedition. Bernalillo became an established community in 1695, following the Pueblo Revolt of 1680 and the ensuing re-conquest of New Mexico by Don Diego de Vargas. Archbishop Jean Baptiste Lamy oversaw the construction of forty-five new churches and chapels during his stay in New Mexico. Santuario de San Lorenzo in Bernalillo was one of them, completed by residents in 1857. The impressive structure, featuring four-foot thick adobe walls, twelve-inch vigas and an earthen floor, served as the parish church of this historical central New Mexico town for over 100 years. It is one of few examples in New Mexico of French architecture built with native materials. 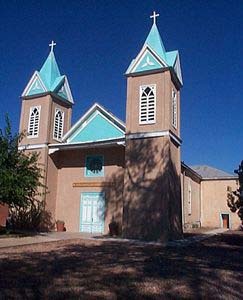 In modern times, because of its proximity to Albuquerque (20 miles), Bernalillo and the surrounding countryside have become increasingly urbanized, and Santuario de San Lorenzo is one of few historical sites left in the area.